It seems like yesterday when Hazrat Khalifatul Masih V, may Allah strengthen his hand, graciously granted approval of starting an English weekly newspaper from the Markaz. Actually, it has been a whole year. Being able to successfully publish a weekly newspaper online every Friday, we – the Al Hakam team – praise and thank Allah for His blessings that we have witnessed all along. At the time, Huzoor(aa) referred to his Friday Sermon that he had delivered a few weeks earlier, where he had mentioned Hassan Muhammad Arif Khan Sahib. Huzoor(aa) explained how, having moved to Canada, Hassan Khan Sahib would singlehandedly prepare the monthly Ahmadiyya Gazette – collating material, editing it, handwriting it and then printing it for circulation. Since Huzoor(aa) had mentioned Hassan Khan Sahib with great love in his Friday Sermon, we took it as an honour to be working on the same lines that had received an affectionate mention by Huzoor(aa). The biggest reward we received from Allah the Almighty for wilfully and happily aligning our vision with Huzoor’s instruction was the biggest reward that one can imagine: Huzoor’s constant guidance and support in every matter to do with Al Hakam. Al Hakam was blessed with the opportunity to publish the full text of Huzoor’s Friday Sermon every week; a feature that was non-existent before. We thank the Al Fazl team for providing the full Urdu text and the Review of Religions’ team for translating it and providing it every week. Covering Hazrat Amirul Momineen’s tours brought great pleasure and satisfaction. By constantly striving to acquire updates and making them available to our readers, we felt connected with Huzoor(aa) even when he was thousands of miles away; a greater satisfaction being that our readers felt the same. 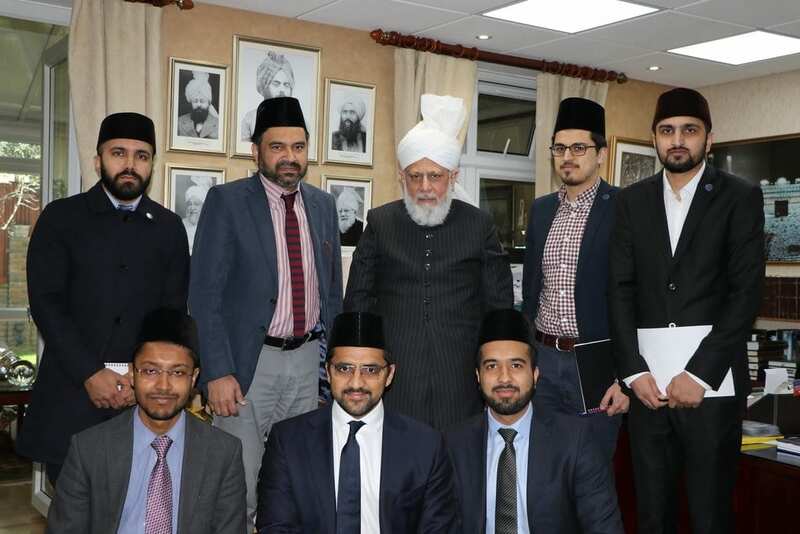 The fact that our efforts got Huzoor’s attention, even for a few moments, while he was so occupied with a hectic routine on his tour, made us feel that we had been given a reward far greater than what our humble efforts deserved. We thank our correspondents in the fortunate countries that had the honour to host Hazrat Khalifatul Masih(aa) during the year, for their continued support in providing updates regardless of time differences and other issues that could easily hinder communication. We would also like to thank the Central Press and Media Office which made it easier for us to acquire updates on Huzoor’s tours. Talking of correspondents, we should proclaim another blessing of Allah the Almighty. It was mentioned to Huzoor(aa) that we wished to establish a strong network of correspondents so that news from all foreign missions could be included as soon as possible and not months after they had happened. Huzoor(aa) graciously granted permission and we were able to, with the support of amirs of foreign Jamaats, to have representation in almost every part of the world. Our correspondents – based all around the world – deserve a huge thanks from us for always being there to report on the Jamaat’s activities, thus making Al Hakam a newspaper in the true sense of the term. Part of the vision behind the launch of Al Hakam was to bring to life the rich history of the Jamaat for our English-speaking audience – being in Urdu meant being unavailable as such. Selections from the vast range of literature produced in Urdu language by Jamaat’s scholars over the last 130 years were translated into English and included in the 52 issues that punctuated, on a weekly basis, the whole of last year. Particularly enjoyed by our readers were diaries of early Ahmadi missionaries to the West, most saying that it was awe-inspiring to know what challenges our early missionaries faced during the days when Muslim missions in Western countries was an alien concept for the West (and also for the rest). “100 Years Ago…” aims at bringing out material in English that was originally published exactly a century ago in the Jamaat’s newspapers and magazines. This series has received great commendation and appreciation by our readers. With this series, we were able to include images of archived documents from the Jamaat’s history, thanks to the collection at the Ahmadiyya Archive and Research Centre, London. A series that our English-speaking audience enjoyed by being connected to the legacy that stretches across our 130-year-old history is “This Week in History”. This regular column proved that brevity does not always compromise interest, it can rather work as a catalyst. Giving a flavour of how the dates of a certain week were important in the Jamaat’s history, this series has been immensely successful and is much awaited each week. All these features put together are outweighed by one single feature of Al Hakam. This great feature and great blessing are the interviews with Hazrat Amirul Momineen(aa) on various matters, exclusively and graciously granted to Al Hakam by our beloved Imam(aa). Monitoring analytics of the issues that carried Huzoor’s exclusive interviews were faith-inspiring for all of us at Al Hakam. The trajectory of readership would spike to phenomenal levels on the day and on the days following such blessed issues. We would see this spike stretching beyond any precedent levels and three- to four-digit numbers in the “active-user” field of the analytics for the span of such days. The comments we received on these interviews of Huzoor(aa) and the great zeal with which readers share the blessed words is a unique angle of love between Khalifa and Jamaat, and we were fortunate to have witnessed this. Readers’ feedback has been paramount in giving direction to our humble efforts. We conclude with inviting your feedback and the reassurance that it is always welcome. Our upgraded website now provides the option to leave your comments for individual articles or columns. If our editorial teams find your comments to be useful for other readers, we will, Insha-Allah, publish them under the respective article. Our upgraded website and app come with the option to share anything you like through popular social media platforms. We thank you as our readers for your support all along and hope to have the same in the future, along with your prayers of course!